Is it really a part of the safety procedure before liftoff, that the pilot stands on the aircraft? And how small it looks! The pilot might fit into it, if there’s a hatch for him to crawl through. But passengers? What’s the point of experiencing microgravity while one is strapped to a chair? To look out of one of those tiny windows? Suborbital never interested me, but at first glance this is kind of looking like a fraud. 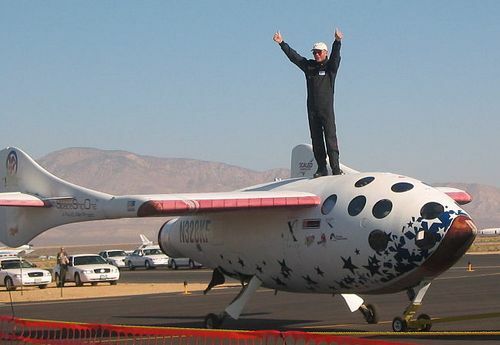 That’s spaceshipone, from ten years ago. You know, the small experimental aircraft designed solely to reach the Karman line and that never carried passengers. Do you read these before commenting? And a decade later the “experiment” still goes on. But without any new actual crewed flights. The whole suborb thing got tiresome long ago. There’s no use for the concept and Virgin uses it only as a gimmick. This won’t fly. No use for the concept? You are aware hundreds of people have already paid for flights, right? VG hitting technical issues doesn’t invalidate the entire concept of suborbital space tourism. Anytime you have companies running rocket motors a lot it will act as a forcing function for improvment of reliabilty and maunfacturing. So no, it does have worth if only to improve the cost and reliability of this technology. Also the picture is taken after landing. Scaled hitched SS1 to the back of a pickup with Paul Allen and Burt Rutan on the tailgate. It was a brilliant piece of PR for those of us who waited hours not knowing if we would see a piece of history, or a delay. 10 years later, we still don’t know if we witnessed something significant, or just an interesting cul-de-sac of technology and will-power of a talented and gutsy team. Either way, it was a great event! Happy 10th!